Please explore our current openings for opportunities within the USA and Power on! When applying, please include the job title in your email subject line. Megger provides equal employment opportunities (EEO) to all employees and applicants for employment without regard to race, color, religion, gender, sexual orientation, gender identity or expression, national origin, age, disability, genetic information, marital status, amnesty, or status as a covered veteran in accordance with applicable federal, state and local laws. 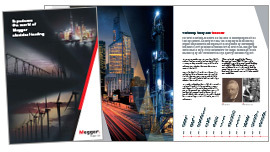 Megger is an equal opportunity employer of individuals with disabilities and supports the hiring of veterans.